If scuba diving or at the very least, snorkeling is your cup of tea, then chances are you would have also invested in a good quality waterproof camera (assuming you do have the necessary shutterbug skills to go along with your other wet, wet passion, of course) – either that, or a DSLR with an expensive underwater housing. Well, Samsung intends to cater to those who are just starting out on this underwater photography thing with their latest release – the Samsung W200. 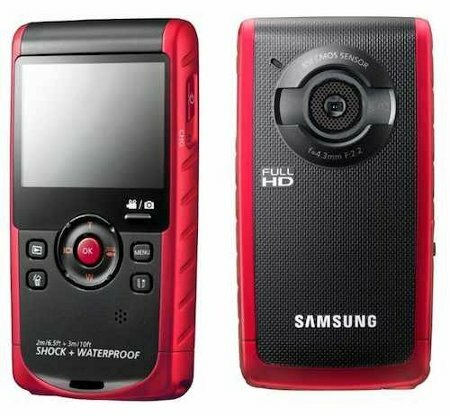 Of course, the Samsung W200 first and foremost is not a digital shooter but rather, one that captures video underwater. What you can’t do with the Samsung W200, however, would be to bring it along with you on your deep underwater forays, since anything more than 3 meters would turn it over to a candidate for the vast consumer electronics graveyard. Of course, that does not mean it is a sissy by any means since it would be suitable to shoot great video of a relaxed day by the pool, or perhaps even up-close shots of coral reefs. The W200’s anti-water drop coating translates to the LCD display being free of condensation, even though you are in damp conditions, allowing you to continue with your amateur filming sessions without having to wipe the display. The lens itself comes with anti-fog coating which allows steam to disperse so you always have clear, blur-free videos and pictures even if you decide to come straight after out of the pool. In order to shoot amazing underwater footage without looking too complicated, the W200 will also include an Aqua Mode setting, where it will automatically set the ideal parameters for the bright and clear underwater video. Do not look down on it just because the W200 is slim and compact – it is a tough cookie on its own, being shock-proof and dust-proof, making it more or less the perfect candidate to bring on your next backpacking adventure. Heck, surely you don’t mind letting Junior have a go at this since it is robust enough to withstand some minor knocks and drops, and with a built-in USB arm, it is even easier to share your adventure at your next stop. The Samsung W200 will be out later this May for $159 a pop.